I said a little prayer today for Patrolman Terry and his family. He may be gone but never forgotten. He will always be a New York HERO. You were on your way to pick me and your son up when this incident occurred. I was 4 years old. I still remember. I am proud that you were my uncle. I am proud that you dedicated yourself to protecting the people of New York. You are a hero, my hero and I will never forget you. Your heroism and service is honored today, the 40th anniversary of your death. Your memory lives and you continue to inspire. Thank you for your service. My cherished son Larry Lasater was a fellow police officer who was murdered in the the line of duty on April 24, 2005 while serving as a Pittsburg, CA police officer. He was also your brother in green so I bid you semper fidelis. Your heroism is what law enforcement is all about. Rest in peace brother officer. You are remembered today and thank you Sir for your police and military service. You are the 2nd NYC Housing Authority Police Officer I have left a reflection for on 12-20, the prior one just 4 years earlier. 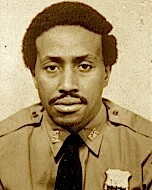 Patrolman Terry, today marks the 35th anniversary of your murder. We can only hope that your murderer faced justice, if not in this life, then in the next. You are a hero. It’s sad whenever a Brother or Sister is lost, but there is an extra bit of sadness in that, just 4 short years earlier, another NYC Housing officer was shot and killed on the same date and the agency with which you both so proudly served no longer exists. The New York City Housing Authority Police Department may be a part of history, but that agency and you brave men and women who served in its ranks are NOT forgotten. I would like to say thank you for your service and sacrifice-not just for your community, but for our Country as well when you served in the USMC.